Keywording is so time-consuming and I keep running out of ideas of what to tag photos as. I don't have a question. I'm just complaining. ha! Seriously....it's not that bad, but some days I zone out doing it. This is absolutely true, but good keywording is just as important as being able to take and process a good picture. At least you are not making the mistake of trying to fill every one of the fifty available keyword slots and falling into the realms of irrelevancy in doing so. Perseverance and relevance will bring rewards in time. You need to get into the mindset that keywording is fun. I quite enjoy the research involved, and trying to get one over the competition by finding more relevant facts that may help flog the photos. I hate keywording too. But if I go out to shoot photographs, and take into account the time to get there and back, the time spent walking around, finding the right locations and angles, and the time to process them all afterwards and get them up on Alamy, then keywording is probably the least time-consuming part of the process, especially as many of the pics will share a good number of keywords. And then I can always go back and improve the keywording later, with minimal effort compared to re-shooting, even if that's possible. I'd rather gouge my eyeballs out with a rusty screwdriver and fry them in a pound of lard than keyword images, but it's something which has to be done. Ugggggh. Keywording is so time-consuming and I keep running out of ideas of what to tag photos as. Hmmmm, if you don't know what to tag photos as, maybe there isn't a clear subject or concept in the photo, as all you need to do is keyword what's in the photos. Might I humbly suggest that you have some very similar images in your port, and if you were trying to distinguish between them by caption or keywords, you would indeed have problems. If you use a keyword suggestion tool, make sure you carefully go through the suggestions and delete those which are irrelevant to your image. Many people don't do that, so end up with lots of irrelevant keywords. NOT criticising David above, I haven't looked at his keywording. But in many cases when people have irrelevant keywords, they remonstrate, "Oh, but I used X keyword tool" (sadly, without engaging brain). I find it far more interesting keywording things I don't know exactly what they are because I learn stuff and find out things I did not know before. Like I can now tell the difference between cow parsley and hemlock because of keywording - I never even knew they were similar until I was captioning and keywording photos. I find it far more interesting keywording things I don't know exactly what they are because I learn stuff and find out things I did not know before. Totally agree with that, though I can get quite distracted following links. Now, if only I could remember what I'd learned! Me too. I actually enjoy writing more than the basic and finding synonyms or conceptual key words, if needed. Learned a great deal. Also a great way to keep up your foreign language skills. 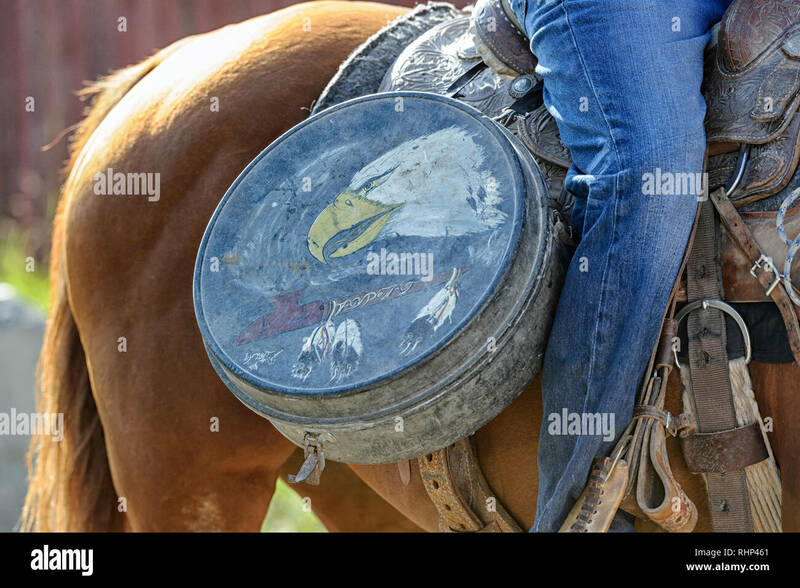 I shot this rodeo image (RHP461) that had a painted tin container attached to the saddle. As the saying goes, this wasn't my first rodeo but I had no idea what that was. Google wasn't going to help as I had no starting reference point. So after pondering this over for about 15 minutes, it occurred to me that a lariat would fit nicely inside. I checked on the internet and found exactly one site that had something like it for sale. It turns out that it's a lariat carry case used by trick rodeo riders back in the 1920's. Shooting is the fun part. Most everything else is work. OK, there is the occasional enjoyable "Aha" moment while researching for keywords. Unless it takes a long time, like trying to figure out exactly where I was while wandering around the Old City in Jerusalem. I'm vegetarian but find a strange affinity with this. Eyeballs, screwdriver, lard, all well represented, but for the phrase tag- "Sorry, we can't find anything for your search term"- Alamy. Only 24 for "pound of lard" though. Seriously, OP, over time you can copy over a lot of tags for similar images in AIM. Funny, at first glance I thought it was a repurposed 1000 foot magazine for an Arriflex 35BL. It's not much fun, but AT LEAST as important as taking great photos. You may have taken the best photo in the history of photography, but if nobody finds it, it's not going to sell. I agree with the comments on the importance of key wording and describing what's in the image but i also try to think about what a Google Searcher might type in. sometimes querky phrases like "show me the money" or IFRS-15 generate views that I wouldn't otherwise get. In short, my point is that key wording is your sales line to get people to look at your product. At least you are not making the mistake of trying to fill every one of the fifty available keyword slots and falling into the realms of irrelevancy in doing so. That was my mistake during the test-phase at Alamy. I have ~4000 pictures to upload and I thought 50 tags per image will drive me crazy.